Couchbase and Tegile combine to deliver superior scale for Operational Applications on Cisco UCS. Copyright 2016 Tegile Systems. All rights reserved. For the digital economy companies, ability to scale without downtime for user growth and capacity is mission critical. Creating and maintaining this cost effectively is a business requirement. This solution brief describes the solution architecture with Cisco UCS, Tegile IntelliFlash and Couchbase. Digital economy companies are deploying mission critical applications on Couchbase. Performance, scalability and total cost of ownership (TCO) are the reasons to move for traditional RDBMS to Couchbase. It’s important that the Couchbase delivers consistent high levels of performance and scalability. But this can be difficult without the right server and storage infrastructure. Lack of right sizing and infrastructure will affect revenue and productivity. YCSB benchmark results validate the solution. Tegile offers a comprehensive portfolio of all-flash and hybrid storage solutions that increases transaction throughput by 10x, delivers sub-millisecond latency and dramatically reduces your storage footprint, as well as offers comprehensive enterprise data protection and business continuity features at no extra license cost. The reference architecture in this document are applicable to Couchbase 4.5 and onwards. The Cisco Unified Computing System addresses many of the challenges faced by database administrators and their IT departments, making it an ideal platform for Couchbase workloads on Tegile unified storage. The system uses an embedded, end-to-end management system that uses a high-availability active-standby configuration. Cisco UCS Manager uses role and policy-based management that allows IT departments to continue to use subject matter experts to define server, network, and storage access policy. After a server and its identity, firmware, configuration, and connectivity are defined, the server, or a number of servers like it, can be deployed in minutes, rather than the hours or days that it typically takes to move a server from the loading dock to production use. This capability relieves database administrators from tedious, manual assembly of individual components and makes scaling Couchbase a straightforward process. The Cisco Unified Computing System represents a radical simplification compared to the way that servers and networks are deployed today. It reduces network access-layer fragmentation by eliminating switching inside the blade server chassis. The system eliminates the limitations of fixed I/O configurations with an I/O architecture that can be changed through software on a per-server basis to provide needed connectivity using a just-in-time deployment model. The result of this radical simplification is fewer switches, cables, adapters, and management points, helping reduce cost, complexity, power needs, and cooling overhead. The system’s blade servers are based on the Intel Xeon 5670 and 7500 series processors. These processors adapt performance to application demands, increasing the clock rate on specific processor cores as workload and thermal conditions permit. These processors, combined with patented Cisco Extended Memory Technology, deliver database performance along with the memory footprint needed to support large in-server caches. The system is integrated within a 10 Gigabit Ethernet-based unified fabric that delivers the throughput and low-latency characteristics needed to support the demands of the cluster’s public network, storage traffic, and high-volume cluster messaging traffic. The business world is undergoing massive change as industry after industry shifts to the Digital Economy. It’s an economy powered by the Internet and other 21st century technologies – the cloud, mobile, social media, and big data. At the heart of every Digital Economy business are its web, mobile, and Internet of Things (IoT) applications: they’re the primary way companies interact with customers today, and how companies run more and more of their business. The experiences that companies deliver via those apps largely determine how satisfied – and how loyal – customers will be. Building and running these web, mobile, and IoT applications has created a new set of technology requirements. The new enterprise technology architecture needs to be far more agile than ever before, and requires an approach to real-time data management that can accommodate unprecedented levels of scale, speed, and data variability. Relational databases are unable to meet these new requirements, and enterprises are therefore turning to NoSQL database technology. Couchbase enables you to build applications that evolve quickly: Since the data model is represented as JSON in the database, you can extend and modify it on demand easily. Application objects can be represented directly in rich structure of JSON, avoiding translation and impedance mismatch between applications and databases. Couchbase comes with a powerful query language N1QL – based on the SQL, enhanced for JSON. You can develop your applications in rich set of APIs, available for every enterprise language and framework. Couchbase Server 4.5 enables enterprises to scale easily, efficiently and reliably, from laptops to clusters to clouds, with “push button” simplicity. Couchbase architecture is shared-nothing and has no single point of failure. Adding nodes is simple; data & services are automatically repartitioned. The multi dimensional scaling allows scaling the database services independently, optimizing the performance & resource usage. Couchbase has continuously pushed the performance envelope to meet the digital economy requirements. Customers routinely perform millions of reads and writes on Couchbase clusters. The YCSB benchmark with Cisco UCS Servers, Tegile All Flash arrays and Couchbase 4.5 has shown sub millisecond latency on the database operations in mixed workload and near linear scaling. There are additional independent performance benchmarks using YCSB have shown Couchbase 4.5 performance significantly superior to other NoSQL database systems in read, write, scan and mixed workloads. Checkout http://www.couchbase.com for the full report. Flash storage has the power to fundamentally transform how you do business, but until now solutions have forced you to compromise on performance, price, or features. At Tegile, we don’t believe in compromises. Our hybrid and all flash storage arrays are engineered to support multiple grades of storage media to deliver optimal performance with the best possible economics. They also include a full suite of advanced data services, multi-protocol support, and robust management capabilities. So why compromise? Get a flash storage that’s fast, flexible and affordable. Tegile flash storage arrays are powered by IntelliFlash™, a software architecture that leverages different grades of storage media to deliver optimal performance (speed and latency) with the best possible economics. IntelliFlash also includes advanced data services, multi-protocol support, and robust management capabilities, enabling you to significantly shrink your storage footprint, maximize uptime, consolidate workloads, and simplify storage administration. Tegile IntelliCare is a cloud-based support platform designed to simplify storage administration and maximize the uptime and efficiency of your Tegile flash storage arrays. With IntelliCare, you can quickly and easily monitor the health, performance and usage of all your Tegile arrays, predict future requirements, and detect problems before they develop into component and system failures. 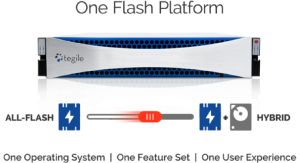 Tegile IntelliFlash storage arrays deliver low latency and high IOPS for virtual server environments running performance-hungry applications like VDI, Couchbase, SharePoint, and other business-critical applications. Tegile arrays deliver 5X the performance of traditional storage arrays for one-third the cost, allowing you to virtualize more enterprise applications and achieve better VM consolidation. All Tegile arrays support multiple protocols – Fibre Channel, iSCSI, NFS and CIFS/SMB 3.0 simultaneously from the say array. You can choose to provision storage for virtual machines using block storage or file protocols like NFS and SMB 3.0*, depending on your specific needs. In addition to virtual machines, you can also provision file shares for the virtual machines using NFS or SMB 3.0, all on a single Tegile array. Instead of deploying multiple arrays from different vendors, you can consolidate multiple workloads on a single Tegile array. Reduce your storage capacity needs for virtual servers by 90% using Tegile’s data reduction technologies. 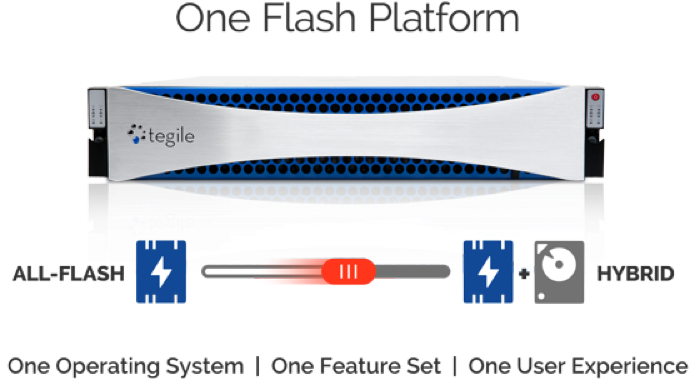 Tegile’s patented IntelliFlash™ technology enables inline data deduplication and compression of data across both flash and hard disk drives. Moreover, deduplication and compression act as performance multipliers by maximizing the use of flash storage. Tegile’s unique data reduction capabilities dramatically cut down your storage acquisition and operational costs. Compress your databases by 2x – 5x and maintain multiple copies of your data without taking up additional storage space, through inline compression and deduplication. Tegile Intelligent Flash Storage Arrays are able to reduce Couchbase write times with IntelliFlashTM, available across the entire line of Tegile storage arrays. IntelliFlash is a flash-optimized software architecture that seamlessly integrates multiple grades of storage media to deliver optimal performance and capacity. All Tegile arrays come bundled with space-efficient snapshots and clones. All Tegile arrays also come bundled with snapshot based remote replication software for bandwidth efficient and VM consistent and application consistent data replication across datacenters. With Tegile, the VM infrastructure and application data for your enterprise applications are always available. IT organizations often deploy multiple storage arrays to fit the protocol needs and workload characteristics of specific databases. Tegile arrays natively support both block and file protocols, enabling you to host Couchbase database cluster and your other workloads on a single array. Supported file protocols include NFS, CIFS and SMB 3.0. Block protocols include iSCSI and Fibre Channel. All protocols can be used simultaneously over a variety of storage ports. Prevent data loss due to corruption and ensure your data is available 24×7. 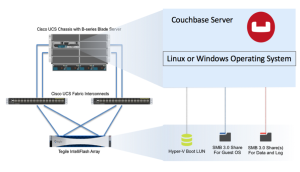 When deploying Couchbase on Tegile arrays, you will benefit from the resilience, end-to-end data integrity, and high-availability features provided by the IntelliFlash architecture. With Tegile arrays, there is no single point of failure. The controllers are configured in an active/active mode and can be configured for simultaneous data access. Capacity expansion, system upgrades, media swaps are performed with zero downtime and minimal performance impact. To protect against silent data corruption, Tegile arrays perform a checksum process to match data blocks as writes and reads happen and automatically fix corrupt blocks. 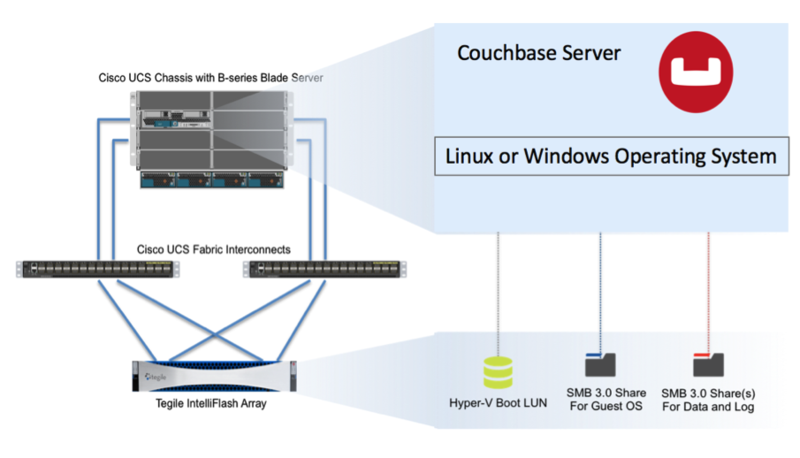 Couchbase is deployed on all of the Cisco UCS blades. The YCSB benchmark was run with 4 Cisco UCS blades, Tegile IntelliFlash and Couchbase 4.5 to verify the reference architecture. This is a mixed workload with 50/50 reads and writes. Session stores, sensor management are all example applications for this workload. With 4 YCSB clients, Couchbase Server maintained 95th percentile latency of 0.24ms (240 microseconds) for each operation. The results show linear scalability with Couchbase Server 4.5 running on Cisco UCS and Tegile IntelliFlash. All of the workload queries short range of documents/rows, instead of individual documents/rows. Threaded conversations, listing customers by postal code, product by category are all examples for this workload. With 4 YCSB clients, Couchbase Server maintained 95th percentile latency of 13.64ms for each operation. Each operation is doing an index scan by range, ordering and getting the top-k documents. That means, each workload operation is doing many more operations, just like a complex query. The YCSB results above show consistently low latency at high throughput for the two typical workloads. The combination of Couchbase database, Cisco UCS Platform Architecture combined with the flexibility of Tegile IntelliFlash makes it a dependable enterprise solution for high performance or high capacity workloads. global indexes to avoid scatter-gather. Data block checksums Intra-cluster and inter-cluster replication, rack awareness for intra-cluster replication. Consolidation Varying workloads on same fabric using instrumented QoS and Virtual interfacesMultiprotocol via different port options Store critical files on all flash pools Multiprotocol FC, iSCSI, SMB 3.0 and NFS (DNFS) Multi-demensional scaling to deploy multiple workloads, scaling suitable services. Reduce Infrastructure Costs Stateless computing allows fewer spare systemsConverged 10G fabric, FCoE reduces infrastructure Thin ProvisioningInline Compression and deduplication, up to 90% space savings Elastic scaling: Deploy for current capacity, Scale to peak capacity on demand.